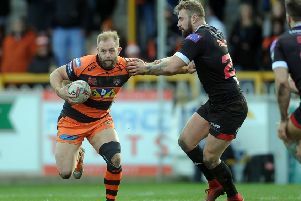 Castleford Tigers boss Daryl Powell was delighted with the way his team started before going on to complete a potentially vital 30-22 Super League win at Hull KR. For the second week running the Tigers shot into an 18-0 lead to take control and although Hull KR hit back to make it a close game the blistering start was to prove crucial. Luke Gale dives over for a try for Castleford Tigers at Hull KR. “We’re starting great at the moment and blew Hull KR away in the first 20 or so minutes,” said Powell. “They got something off a kick and we dropped off a bit. “The pleasing thing is we had a real tough second half to ride through and we came through it. “It certainly wasn’t pretty but nobody will remember that at the end of the season. “It was about winning. It was a real key game for us. You could see it meant a fair bit to both teams. It was a good result for us, it’s a tough place to come.